More than half of Americans ages 45 and older take a daily aspirin to protect their heart health. But do they all need to? We break down the benefits and risks of taking an aspirin every day — and why it may not be right for everyone. Why are so many people taking a daily aspirin? How much aspirin should someone take daily to reap those benefits? I recommend taking a baby aspirin per day, which is 81 mg of aspirin. Let’s back up — isn’t aspirin a pain reliever? Yes, it was developed as a pain reliever, and we still use it that way. But it also has an extra benefit for people at risk for a heart attack or stroke. So how does a painkiller lower the risk for heart attack and stroke? It has to do with how aspirin affects special cells in your blood called platelets, which help your blood clot. Whenever you get a papercut or knick your skin shaving, platelets take action — they build up and form a plug that stops the bleeding. The problem is that platelets sometimes clump together where you don’t want them — in your arteries. They can form a clot that causes a heart attack or stroke. Aspirin can help lessen the effect of these platelets. Your blood becomes a little less likely to clot, and that lowers your risk of a heart attack or stroke. If that’s the case, should everyone be taking an aspirin a day? No, they shouldn’t — aspirin can have serious side effects for some people. Because aspirin blocks your blood’s ability to clot, some people start to bleed or bruise really easily. They cut themselves shaving and bleed for half an hour, or they get big, painful bruises after playing with their grandchildren. Aspirin can also upset your stomach and increase the risk for ulcers and heartburn. These are real side effects that can create serious quality of life issues. If you start taking aspirin and have problems, talk to your doctor about whether you need to stop. The right choice is always a personal decision. So who needs aspirin — how do you balance the benefits and the risks? If you’ve had a heart attack, a stroke, or surgery to put a stent in an artery, you need daily aspirin for the rest of your life. If you’ve never had a heart attack or stroke but you’re 56 or older and have multiple risk factors — like if you smoke, have high blood pressure, and have a family history of heart disease — the benefits of taking daily aspirin may well outweigh the risks. However, talk to your doctor about whether or not you should be taking a daily aspirin. Finally, if you are at low to moderate risk for a heart attack or a stroke — like you just have high blood pressure or high cholesterol — it's not clear whether you really need daily aspirin. In those cases, you should also talk to your doctor about what’s best for you. Are there people who definitely shouldn’t take aspirin? As I said, some people need to stop because of side effects. Others find out they have an allergy to aspirin. In those cases, I often prescribe a different kind of platelet blocker, called Plavix (clopidogrel). Also, people who already take blood thinners like Coumadin (warfarin) don’t always need to take aspirin — blood thinners have been shown to lower risk of heart attack or stroke. But if you’re on both a blood thinner and aspirin, you should not stop the aspirin until you confirm with your doctor that it’s OK to do so. 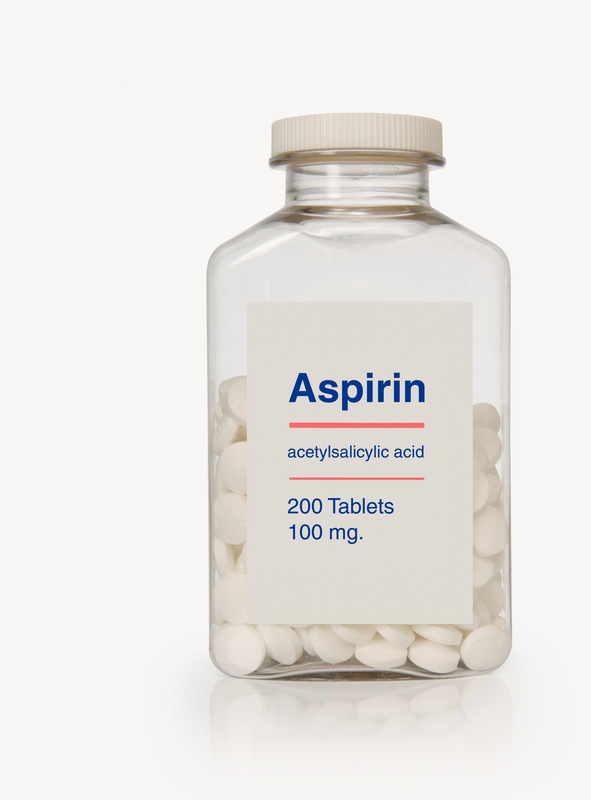 What’s the most common misperception when it comes to aspirin? Many people think they need to start taking a daily aspirin for heart health as soon as they hit age 55 or 60 regardless of their risk. That’s what doctors recommended decades ago, but our understanding of the benefits and risks of a daily aspirin, and the guidelines, have evolved since then. There’s also an assumption that aspirin must be safe. Just because it’s a familiar drug that’s likely been in your medicine cabinet forever (and your parents’ medicine cabinet and your grandparents’ medicine cabinet), that doesn’t mean it’s risk-free or right for everyone. If you’ve had a heart attack or stroke, you should take a daily aspirin unless your doctor tells you otherwise. If you have multiple risk factors for a heart attack or stroke, the pros of taking daily aspirin likely outweigh the cons. Before you start taking daily aspirin — or any regular medication — talk it over with your doctor. Also, if you’re already on an aspirin and think you should stop taking it, definitely talk to your doctor before doing so.